Prosecco is an elite male with a titillating pedigree. 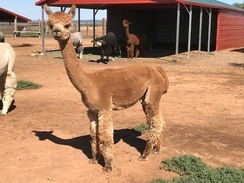 His sire is Sunny Mesa's Tuscan Gold, a truly exceptional herdsire combining the best characteristics of tight crimpy bundles and brightness with flawless conformation. Tuscan is now deceased and his offspring are carrying on his legacy. His dam, Cocoa Puffe is a multi-champion producer. His maternal brother El Corazon sheared 11 pounds as a 3 year old in 2008. Liza is a good foundation female, producing multiple blue ribbon cria including Penelope, a blue ribbon girl at her first show (and the baby in the class), 2015 TxOlan under Arturo Pena. Liza's sire LCA Matteo, is a male with retained fineness of fleece and also retained uniformity and density. 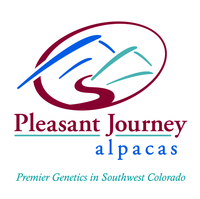 Pleasant Journey Alpacas competed against this boy in the shows. We saw what his offspring have done in the shows and we own one of his amazing daughters who is a 1x CC banner winner and 1x RC banner winner! We bred several of our girls to this amazing Herdsire and we were wowed by the results. We wanted to make sure he still had a presence in Colorado. What a lovely female!! Soft hand to her fleece! Penelope is a head turner and a wonderful female. Easy personality and she passes this to her offspring. What more can you ask for? Sept 2017 she presented us with a gorgeous medium fawn female named PJA Clancy My girl sired by our PJA Golden Victory's Kiowa. Clancy's fleece is awesome and oh so soft! Penelope is bred and confirmed pregnant to Annual's Bea-2 Bomber. This should be another knock out cria!